Owned and made by the Cazes family of Lynch Bages, this is a consistently good wine and deserving of Cru Classé status. This Saint Estèphe is made from around 50:50 Cabernet and Merlot. The density for the vintage is impressive with dark-berry and cherry character. Medium to full body, velvety tannins and a fresh and bright finish. Linear and driven. 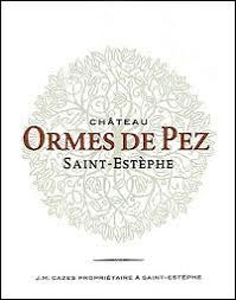 The 2017 Ormes de Pez comes across as a bit light in both body and structure. Spice, leather, dark red stone fruit and new French oak are nicely pushed forward. Easygoing and open-knit, the 2017 is likely to offer its best drinking sooner rather than later. Jean-Michel Cazes told me yields were surprisingly generous in 2017, along the lines of 2009. Merlot plays an especially prominent role in a blend composed of 51% Merlot, 42% Cabernet Sauvignon, 6% Cabernet Franc and 1% Petit Verdot. Very dark crimson. The aroma is equal parts black fruit and graphite. On the palate, some sweetness of oak spice but there's a slight lack of fruit richness on the palate so that overall it is relatively light. Persistent though, and the tannins are fine enough not to dominate. 42% Cabernet Sauvignon, 51% Merlot, 6% Cabernet Franc, 1% Petit Verdot in 45% new oak. Medium-deep purple in colour, this has a muscular and rich nose of cassis and toasty new oak. The palate is chunky with ripe but chewy tannins framing the compact but juicy black fruit core. This is quite big and structured, but the tannins fall away nicely towards the finish to allow the cool black cherry and plum to shine through with the toasty, generously creamy oak. Polished on the finish, this is a well made wine that will offer as much approachability as any wine from St Estephe in 2017. Ormes has managed another good vintage after a run of them. This is a lovely wine and a buy for me. Succulent, bristling and charming, it has juicy brambled fruit extraction and tension. It doesn't take itself too seriously, just asking to be loved. The fruit spectrum is rich with blueberries and damsons, with integrity and a swirl of vanilla bean oak. Includes 6% Cabernet Franc in the blend. No need to wait too long for this. 45% new oak. Drinking Window 2022 - 2035. Chiselled and firm, this is a stern wine with a very forceful demeanour and a slight touch of greenness which might not melt away. I like it a lot, but you will have to be forgiving in due course.